Vanguard: Saga of Heroes was a high fantasy-themed massively multiplayer online role-playing game (MMORPG) created by Sigil Games Online, and later developed and run by Sony Online Entertainment (SOE). Originally, the game was co-published by Sony Online Entertainment and the company producing it, Sigil Games Online. The game was released on January 30, 2007, with an early access date of January 26, 2007 for pre-order customers. On May 15, 2007, it was announced in a press release that Sony Online Entertainment had completed a transaction to purchase key assets of Sigil Games Online, including all rights to Vanguard. The game initially sold around 242,000 copies, while the number of active subscriptions (those who play longer than the free month included when buying the game) was estimated to be around 130,000, to drop in the next months to about 40,000. Following the acquisition by SOE, the developers mainly focused on bug fixes and gameplay improvements for a long time. In July 2008, the developers announced they wanted to attract old and new players as the game had reached a much more presentable state. On September 10, 2008, Game Update 6 finally introduced the long-awaited trial island, the Isle of Dawn, which also quickly became the standard starting area for new regular characters. On October 8, 2008, the trial version was released. On August 14, 2012, Vanguard went to a free to play model. As with any MMORPG, Characters in Vanguard: Saga of Heroes are a player's avatar in the game environment. Twelve characters can be created on a regular account. At creation, the name, gender, race, and adventuring class of the character are chosen and cannot be changed later. The character's appearance is also chosen, but can be modified by the player at any time thereafter, from the character selection screen. After his or her creation, the character can start play either in the starting area of his or her chosen race or in the trial zone called the Isle of Dawn. The character also has the option of picking a crafter class and two harvester skills. Solo play is possible, but, as in many MMORPGs, the classes differ in their solo performance because of the unequal distribution of crucial abilities. Typical soloing strategies, such as self-healing, kiting and fear kiting, are only available to some classes; likewise, controlling fights with crowd control, avoiding fights with stealth or invisibility, and terminating lost fights with fake death or emergency evacuation teleports is not possible for all classes. Some classes, such as the Necromancer, have more soloing options, while some others, like the Warrior, are more narrowly focused. Player vs player (PvP) was available on the Sartok FFA PvP server, in the PvP arenas, or on PvE servers using the /duel command. This aspect of gameplay has never been a priority for the SOE developers. Vanguard classes are therefore not balanced with PvP in mind, and some classes are much more capable in this regard than others. For example, the maximum damage of a single attack is restricted to 20% of a target's maximum hitpoints, but certain classes can combine multiple instant attacks, resulting in "one-shotting", or immediately killing other players in one shot with no chance for the victim to fight back. The second sphere of Vanguard is Crafting, and involves creating in-game items using 'recipes' and raw materials. Crafting recipes are a set of actions that must be performed in a particular order to produce a final result. Each of these actions costs 'action points', taken from an action pool. The maximum number of action points available varies with each recipe. During the crafting process, 'complications' may arise which affect the crafting process, usually, but not always negatively. The crafter can attempt to correct complications or resume crafting and deal with the consequences or benefits of ignoring the complications. 'Diplomacy' is a concept unique to, or at least first introduced by, Vanguard. It is basically a card game inspired in style and rules by collectable card games. Diplomats can enable certain citywide 'civic' buffs and gain certain special items needed for end-game content such as Guild Houses, the Griffon Mount, and other important end-game quests. Harvesting forms a fourth, simple sphere. Characters have a general harvest skill, which controls how well one can help others with their harvest, and can choose two out of five harvest types they want to specialize in, out of the pool of Mining Metal Ore, Quarrying Stone Slabs and Gemstone Samples, Lumberjacking Wood Timbers, Skinning Leather Hides, and Reaping Cloth Bales. Rechoosing these skills is possible, but all previous progress is then lost. Vanguard is set in a high fantasy world called "Telon", unusual among MMO worlds in that it is almost entirely persistent, with no instancing or load screens. Telon does not have "zones" in the manner of most fantasy MMOs, but there are discrete areas, sometimes called "chunks" which delineate content to some extent and serve to provide general geographical reference points. The world contains 19 playable races, many of which are drawn from or inspired by traditional high fantasy sources such as the work of J. R. R. Tolkien and the tabletop fantasy role-playing game Dungeons & Dragons. There are three "continents" on the world of Telon. Each is reachable by direct, contiguous travel from the other continents, via air or sea, or by NPC boat from the major ports of call. There are various ways to travel through Telon, besides simple walking on land: by mount (horse), by player-crafted ships, by a riftway, and by flying mounts. Vanguard players can build two houses per server per account. Telon contains a large number of dungeons with a broad range of size and theme, found in many types of locations; some are very large, and many are above-ground structures or even outdoor adventure areas rather than traditional subterranean catacombs as such. Although most of the dungeon content is aimed at the 'full-group' encounter (six players) there are numerous areas, particularly at the lower levels, designed for solo play and small groups (2-3 players). All dungeons but one are open "public" dungeons; there is no instancing anywhere in Telon with the exception of the Ancient Port Warehouse (APW), added to Vanguard by SOE in late 2007. There is a total of six copies of APW, called "shards," and any new raid force has to choose which of the six copies to enter. Vanguard also features several overland raid encounters. Sigil's original Vanguard team was composed of many EverQuest developers, including designer Brad McQuaid. Development began in early 2002 and a publishing deal with Microsoft was announced in April 2002. The game's title was announced on March 16, 2004, exactly five years after EverQuest was released. Sigil displayed the game's first screenshots in April 2004 and announced that Vanguard would use Unreal Engine 2.0 in May 2004. 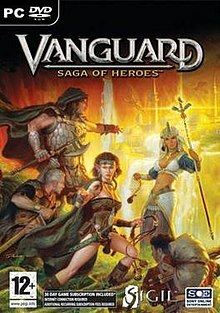 In May 2006 Sigil reacquired the marketing rights to Vanguard: Saga of Heroes from Microsoft and announced that Sony Online Entertainment (SOE) would become the co-publishers. Sigil maintained full control of development, funding, intellectual property rights, and in-game customer service (in the form of the Game Master and Guide programs). Although SOE was responsible chiefly for marketing, publication, distribution, subscription services and maintenance of game servers, some of SOE's game designers and artists did participate directly in Vanguard's development. During an interview in early January 2014 Brad McQuaid revealed that Vanguard had a development budget of $30,000,000.00. He said that compared to World of Warcraft, Star Wars: The Old Republic or The Elder Scrolls Online Vanguard's budget was 'fractional' for such an ambitious game, which put a lot of stress on the development team. Beta Testing for the game began in-house in August 2005 and continued until January 23, 2007. Pre-orders were opened on January 26, and the game officially launched worldwide on January 30 to lukewarm reviews and widespread criticism. This partnership represented a homecoming of sorts for Sigil CEO Brad McQuaid who was - along with Sony Online Entertainment CEO John Smedley, Bill Trost and Steve Clover—one of the four original developers of EverQuest for SISA (Sony Interactive Studios America renamed Verant Interactive in 1999). On May 15, 2007 Sony Online Entertainment announced they had acquired all assets of Sigil and retained over half the developers of Vanguard to work for Sony and to continue developing Vanguard. Brad McQuaid gave an interview two days later to F13.net but since then has not made any public comments about the game. On Dec 22 2009, the team outlined the road map for the game in the year ahead. Due to limited resources and a new focus on bug elimination over ambitious content releases, some of the game's anticipated updates were shelved indefinitely. SOE announced on May 31, 2007 their intention to begin merging servers; the mergers were completed in August 2007. All player-owned housing was reset at this time, causing some controversy among the player community. The mergers left Vanguard without a dedicated role-playing server and without a team-based player-versus-player server. These servers were merged into two servers on July 7, 2010. Following the acquisition by SOE, the developers mainly focused on bug fixes and gameplay improvements for a long time. In July 2008, the developers announced they wanted to attract old and new players as the game had reached a much more presentable state. On September 10, 2008, Game Update 6 finally introduced the long-awaited trial island, the Isle of Dawn, which also quickly became the standard starting area for new regular characters. On October 8, 2008, the trial version was released. On March 12, 2009, SOE announced that it would add its LiveGamer Exchange RMT (real money trading) service to Vanguard, which allows trading game money, items, and whole characters between players, for real currency. On July 7, 2010 the three remaining US game servers were merged into one, bringing the total number of Vanguard servers down to two. After a long hiatus, new game content was announced at the end of July 2011. A game update was released on August 10, 2011, with another at August 24, 2011. On March 21, 2012, SOE announced that Vanguard would become free-to-play in summer 2012. As of August 14, 2012, Vanguard has been free to play. On January 24, 2014 Sony Online Entertainment announced that the game will be shut down on July 31, 2014. On July 31, 2014, at 9:00 PM, the game officially shut down. The game website now redirects to Daybreak Game Company. GameSpy awarded Vanguard the "Biggest Disappointment" award for 2007. Vanguard also won the awards in the categories for "Least Fun", "Most Desolate" and "Lamest Launch" in the MMORPG.com MMOWTF Awards for the worst games of 2007. In both May and August 2008, MMORPG.com revisited Vanguard and gave the updated version a favorable response. On January 24, 2014 Sony Online Entertainment announced that the game will be shut down on July 31, 2014. On July 31, 2014, at 9:00 PM, the game officially shut down. ^ Sony Online Entertainment (May 15, 2007). Sony Online Entertainment Acquires Leading Online Games Studio -- Sigil Games Online Archived 2007-05-28 at Archive.today. Press release. ^ "Official Forum Message: SOE and Vanguard, by Smed, from the SoE Management". Archived from the original on 2007-05-23. Retrieved 2007-05-15. ^ "Interview with anonymous Ex-Sigl member". Retrieved 2007-05-16. ^ "Vanguard Producer's Letter". Retrieved 2008-07-03. ^ "Vanguard Game Update 6 Patch Notes". Retrieved 2008-10-02. ^ "Isle of Dawn - When will it be stand alone?". Retrieved 2008-10-09. ^ "Vanguard - Trial Download". Retrieved 2008-10-09. ^ "Coming soon to Vanguard: Saga of Heroes, Live Gamer Exchange". Retrieved 2009-04-07. ^ "Vanguard July 2010 Server Merge". Retrieved 2010-07-07. ^ "New Content Coming to Vanguard: Saga of Heroes". Retrieved 2011-08-10. ^ "Game Update – Wednesday August 10, 2011 at 4:00 am Pacific". Retrieved 2011-08-10. ^ "Game Update – Wednesday August 24, 2011 at 4:00 am Pacific". Retrieved 2011-08-24. ^ "Exciting Vanguard Announcement – March 2012 Producer Letter". Retrieved 2012-12-22. ^ Fahey, Mike (24 January 2014). "Sony Online Entertainment Shuts Down Four MMOs". Kotaku. Gawker Media. Retrieved 25 January 2014. ^ "GameSpy's Game of the Year 2007". Archived from the original on 2008-01-06. Retrieved 2008-01-07. ^ MMORPG.com - Your Headquarters for Massive Multiplayer Online Role-Playing Games! ^ "Correspondent - How I Came Back to Vanguard". This page was last edited on 30 November 2018, at 04:24 (UTC).